Our university placement volunteer Hillary Fortin who has been working on the GSA Archives and Collections Ceramic Collection talks about Heather Jack and Alison Brown’s visit to the Archives. 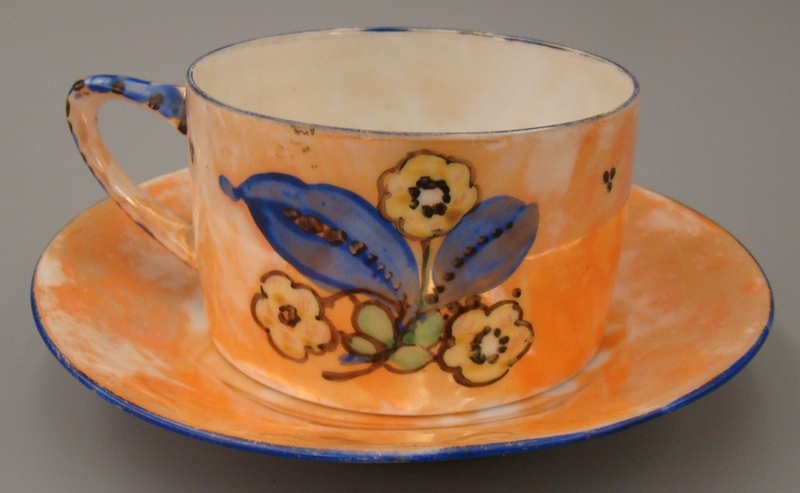 The aim of my work placement with the Glasgow School of Art Archives and Collections is to research and enhance the documentation of ceramic objects held within the GSA’s museum collections. 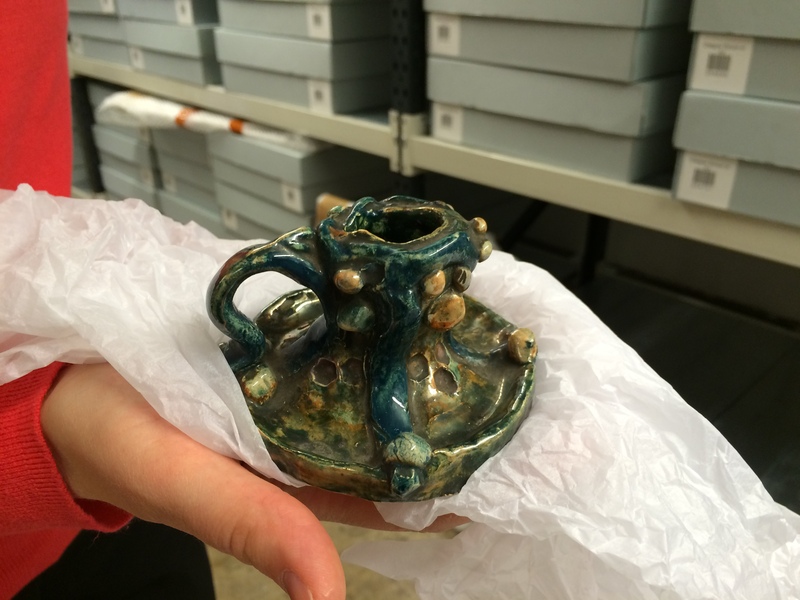 These range from 13th Century Persian pottery fragments to student work from the 20th Century. Along with researching and enhancing catalogue descriptions, I am also labelling and repackaging material, as well as collating information into a thematic study resource. Through my research and examination of the ceramics, I have been learning a great deal about the school’s collection as a whole and about the materials and techniques involved in making ceramics. 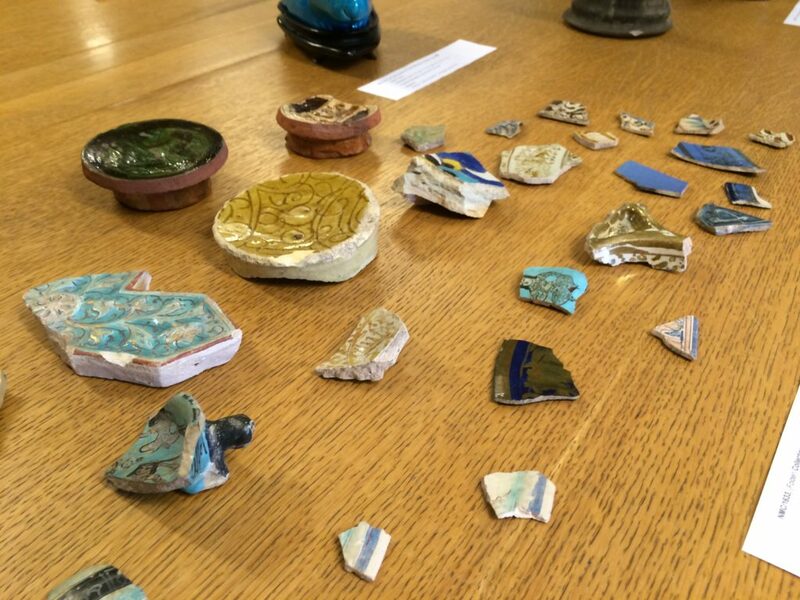 My learning was further enhanced earlier this year when we had two experts visit Archives and Collections to take a look at the ceramics and impart their wisdom. Heather Jack from the Scottish Pottery Society and Alison Brown, Curator of Decorative Arts at Glasgow Museums, had a very informative and interesting discussion with us. 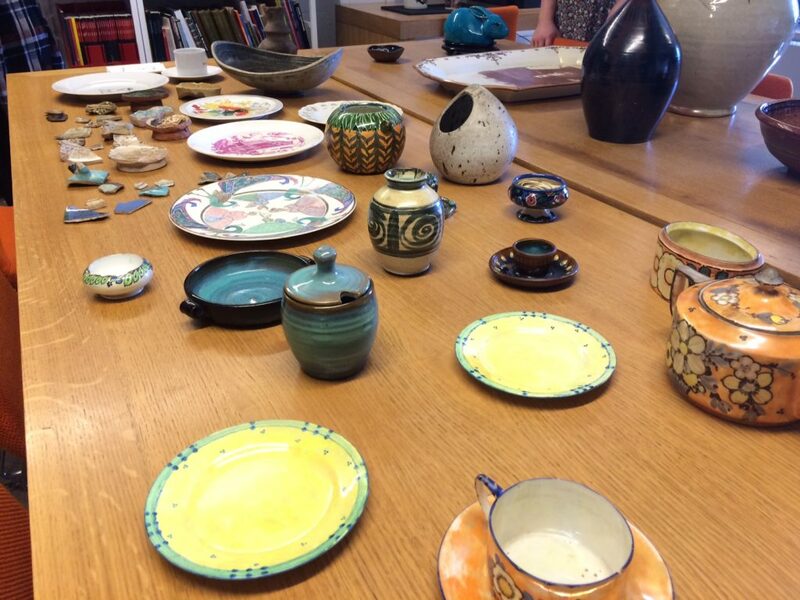 We had a number of ceramics out on display from vases and a ginger jar, to a candlestick holder and plates. 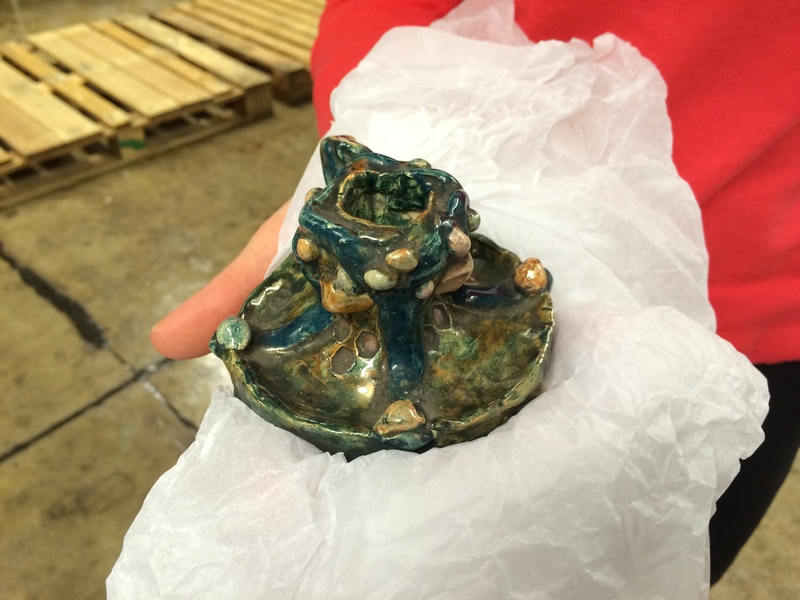 An interesting ceramic, which I asked our visitors about, is Ann Macbeth’s candlestick holder. You might say this particular object is unusual in appearance with its mix of muted colours and peculiar shape. It is clear that it was hand-modelled and is complete with small balls of variously coloured clay applied onto it. In our discussion, it was said that this piece may have been a teaching aid and used as a demonstration of hand-modelling. Alison also pointed out that there are incised lines on the sides of the holder, possibly created using some kind of moulding tool, which was a feature I had not picked up on previously. 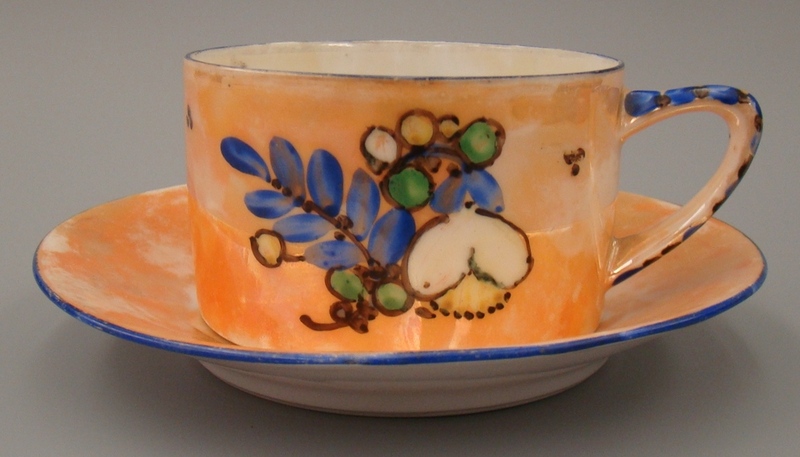 Another particularly interesting discussion we had was about pieces from Ann Macbeth’s orange lustre-glaze china tea service. We discussed the techniques and processes involved with creating the pieces that make up this tea set. 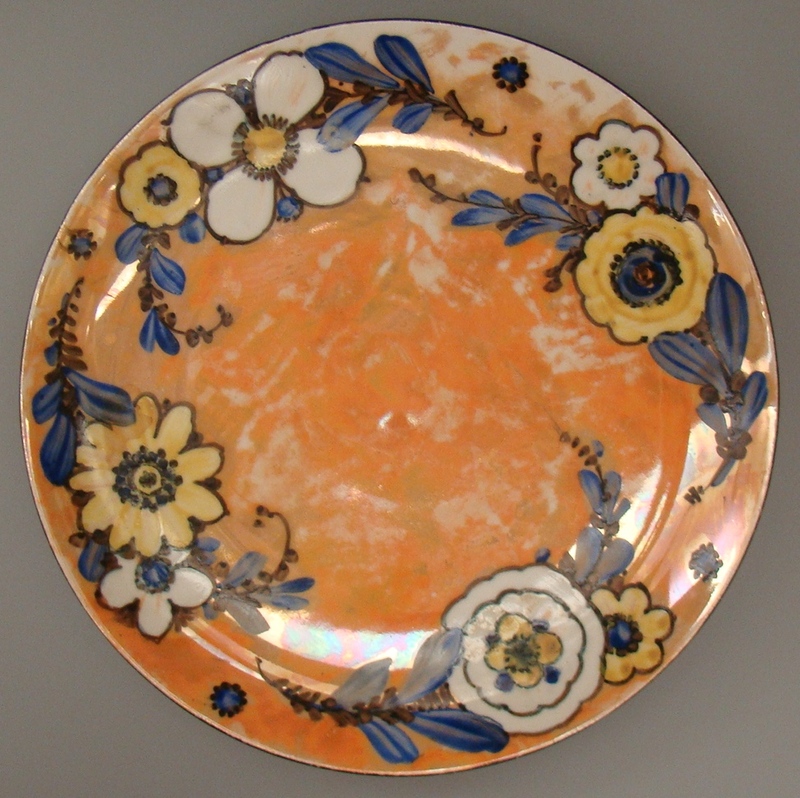 Heather described how the plates, for example, were glazed first and then hand-painted with enamels. 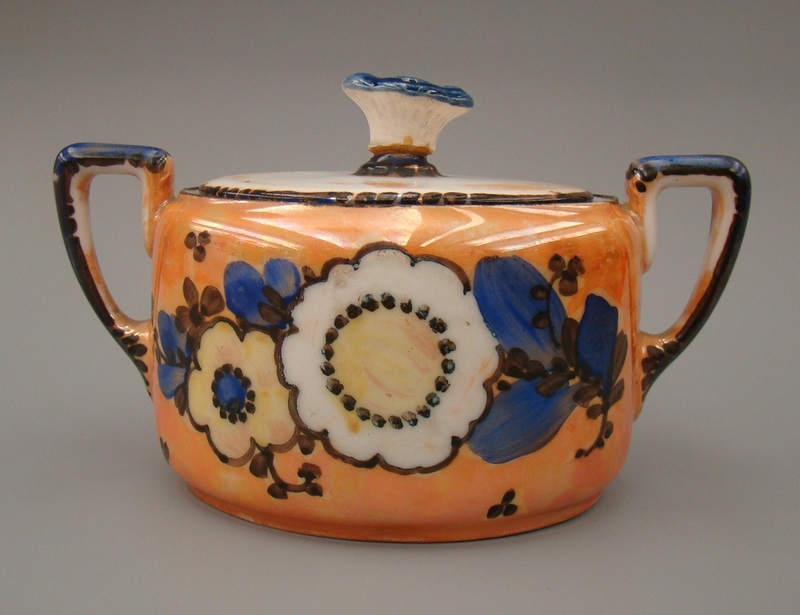 A noteworthy part of this discussion, for me, was about the lustre-glaze. 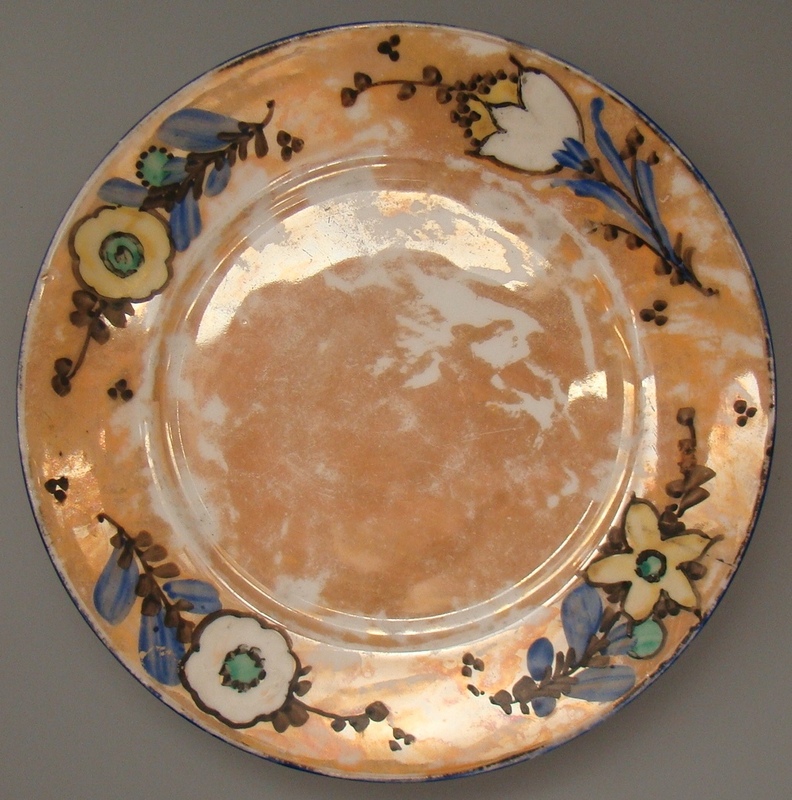 It is easy to see that some of the lustre-glaze is wearing off of the plate leaving areas of the white china visible. 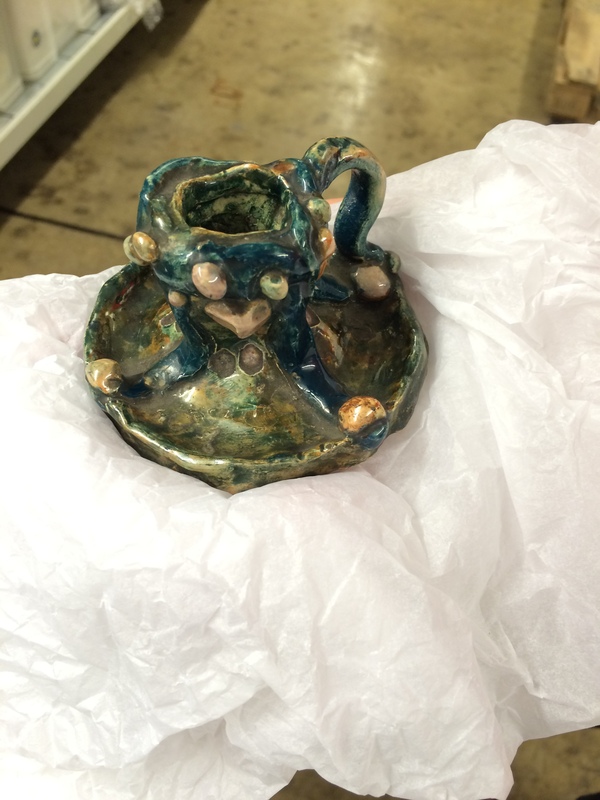 Heather explained that the lustre-glaze is wearing away because it is not underneath the first glaze layer. Because of this, lustre-glaze is quite ephemeral and delicate. Never having known this about lustre-glaze before, I found this to be fascinating and something that will be helpful in my object descriptions.